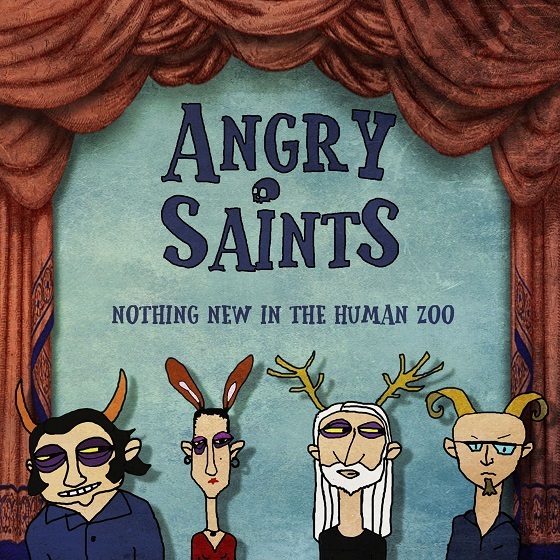 Fresh off the back of releasing their debut album, Nothing New In The Human Zoo, Madrid-based alt-rock outfit Angry Saints have shared new single ‘Satan’s In Your Neighbourhood’. Formed in Madrid in 2015, the foursome comprised of Lindsay Moxham, Ricardo Regúlez, Dave Robinson & Carol Viñe – from Spain, Australia & England – have a preference for powerful alternative rock with a bit of punk, psych and power-pop (among others) thrown in for good measure. ‘Satan’s In Your Neighbourhood’ captures this aesthetic perfectly with its meaty guitars, muscular riffs, rumbling bassline and powerful percussion set to a jarring, frantic and unsettling backdrop. Throughout their album the songs are set against a backdrop of varied landscapes – the sea, the desert, dreams and nightmares; your apocalypse of choice – and aptly with ‘Satan’s In Your Neighbourhood’ it is very much the latter two. What marks Angry Saints (and indeed the debut LP) is an enviable ability to strike a balance between the darker tones in the lyrics, sometimes menacing backdrop and the upbeat/uptempo nature of the sound. A great track and a superb introductory point for their debut LP Nothing New In The Human Zoo. Tune in below.